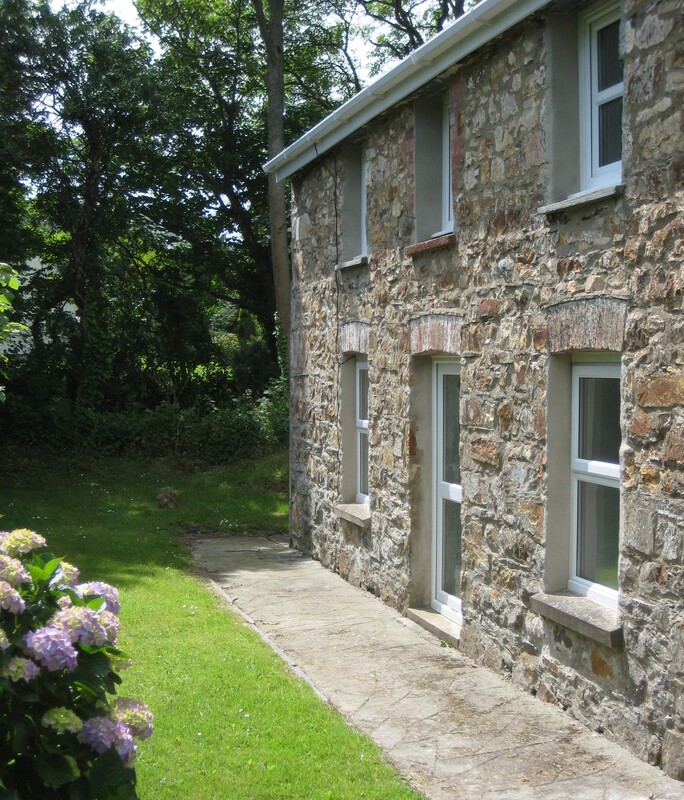 Tegfan, Dinas Cross | A quiet holiday cottage in the Pembrokeshire National Park, near beaches and the coastal path. 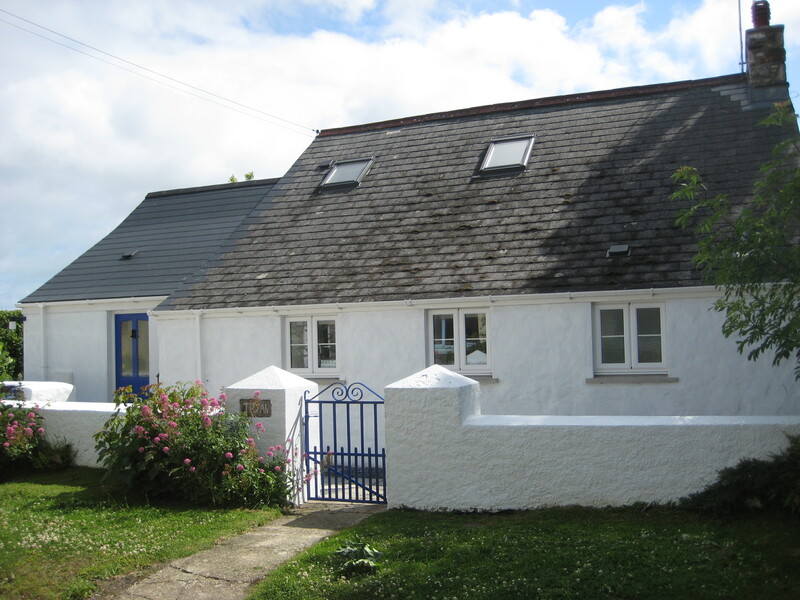 Tegfan, in Dinas Cross, is an old Pembrokeshire cottage that has been owned by our family for the past fifty years. It has recently been modernised and extended to provide more light, heat and bathrooms. It can accommodate six people plus baby, in three bedrooms – one double and two twin. As you can see from the pictures, Tegfan is a back-to-front house, with its back side facing the road. In the past this made things much easier for everyone since it is the custom in Dinas for friends and family to enter a house through the back rather than the front door. Around the house there is a small secure garden with a paved area and a table and garden chairs. Tegfan is at the end of a quiet lane that peters out into a bridle way just beyond the house. If you continue along this picturesque by-way you’ll pass the back of Dinas Country Club and arrive at a road that takes you to Cwm-yr-Eglwys and a farm path to Aberfforest beach. If you turn right as you leave the house and continue straight down the steep winding road, now designated as ‘unsuitable for motor vehicles’, a leisurely stroll will get you Cwm yr Eglwys in about a quarter of an hour. Across the road from Tegfan there is a very pretty path to the main road and Kiel House, the well stocked village shop (a ten minute walk). Outside Kiel House there is a bus-stop. The 412 bus goes to Cardigan, Newport, Fishguard and Haverfordwest. If you are not in a hurry, this can be a car-free holiday. Just had a really relaxing New year’s Eve at this delightful cottage, despite Storm Frank doing its best to prevent us leaving its warm and welcoming interior. The cottage looks as if it has been recently renovated and the whole thing has been done up to a high standard – including quality fixtures, fittings and appliances. The pictures really don’t do it full justice. At only 5-10 minutes in the car from either Fishguard or Newport there are a number of different classy places to visit if you don’t want to stay in Dinas Cross, and I thoroughly recommend The Canteen pizza takeaways from Newport – some of the best pizza we’ve ever had. Overall, I’d recommend Tegfan very highly for anyone looking for a peaceful walking based holiday in an amazingly beautiful part of the World. I hope we’ll be back in better weather one day for a slightly more active holiday! I’m so pleased you enjoyed your holiday in our family cottage inspite of the unusually wet weather that many of us have suffered over the last couple of weeks. I hope you’ll be able to visit again when the paths are less muddy (they seem to recover quite quickly) and it’s easier to appreciate the scenery and the wonderful wild-life!